Valley View now has a brand new 4 person spa on its deck! Enjoy a beautiful view of the White River and valley, 450' below your private 10' x 30' covered deck, now with a 4 person spa (hot tub)! This cabin is fully equipped with a full kitchen, 2 bedrooms, 1 bathroom and a large living area. The Valley View Cabin can be combined with the upper cabin, The Hideaway, via a secured stairwell, sleeping a total of 5 people. 4 person spa (hot tub) on deck! Didn't have to have much dealings with staff, everything was very satisfactory. We greatly enjoyed our stay. The service from calling to check on and booking the cabin to the day we left couldn't have been handled any better. The cabin was very clean and it was stocked surprisingly well. The location was pretty secluded to traffic but close to all the sights and activities. The view was awesome. We will definitely be using your services again on our next trip. Thank you for making our vacation experience so pleasant. I had no problems getting information about the cabins before I decided to rent one. I received my information in an email before arriving. Everyone was so nice and helpful. We had a wonderful time. I needed a cabin with easy access meaning no stairs and a walk in shower for my mom who is on a walker. White River cabins had what we needed. We enjoyed the deck out back which overlooked the White River and beautiful scenery. I will be sharing this with friends and family so they will be able to come and experience the beauty. White River Cabins is our favorite place to stay. 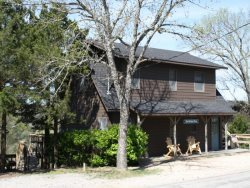 We love the Cabins, view, satellite, internet, and over all feel from the area. It is located within minutes to the river access for kayaking. It is also very close to the town of Eureka Springs. The kitchens are filled with dishes and pans needed for cooking and storage. We love the place and the price. Art and Amy were also very friendly and eager to please. This is a super place to stay. You can't help but love it. The view is gorgeous and the cabin is very clean, updated, loaded with everything you need. Thank you Art and Amy! WE REALLY ENJOYED THE COMFORTABLE STAY. IT MADE OUR WAY TO CANOEING AND THE DAYS IN RIVER WONDERFUL BECAUSE WE DID NOT HAVE TO DRIVE FAR... THANK YOU FOR YOUR HOSPITALITY WHITE RIVER CABINS. ALWAYS, BOBBY AND CANDACE GEORGE OF STUTTGART, ARKANSAS. We didn't really interact with the owners other than checking in and out. Amy did bring extra towels shortly after we arrived (we didn't even ask so that was awesome). Happened to see them walking and for some more dish soap and they were more than happy to drop some off. They were extremely friendly. We were more than impressed with the cabin. We do quite a bit of weekend trips and this cabin is at the top of the list for ones we've stayed in. Great view, comfortable beds and really clean. The deck was great. Art and Amy were friendly and helpful. We enjoyed our stay at the Arkansas White River Cabins so much! The view from the deck was amazing. There was a TV but no one, not even the teenagers, turned it on because the view from the deck was better. I want to go back every season to enjoy the view. Excellent stay!.wouldn't want to stay anywhere else. Art and Amy were very helpful and friendly! Had a wonderful time. Will definitely come back!